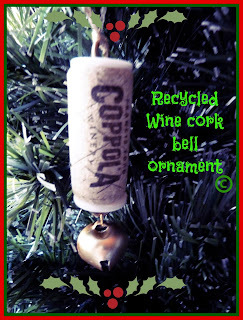 I love working with recycled wine corks. And if you don’t drink wine you can even buy them in craft stores or online. I even saw them billed as bowl fillers in a large discount department store! So wine corks are a plentiful, fun, and sometimes free craft supply. 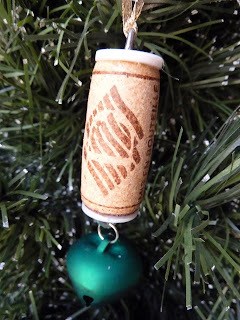 These bell wine cork ornaments are super quick and easy to make and wouldn’t they be awesome to use as a lasting reminder of a treasured celebration like a wedding, anniversary, and more? They make great Christmas presents when presented with a bottle of wine too. 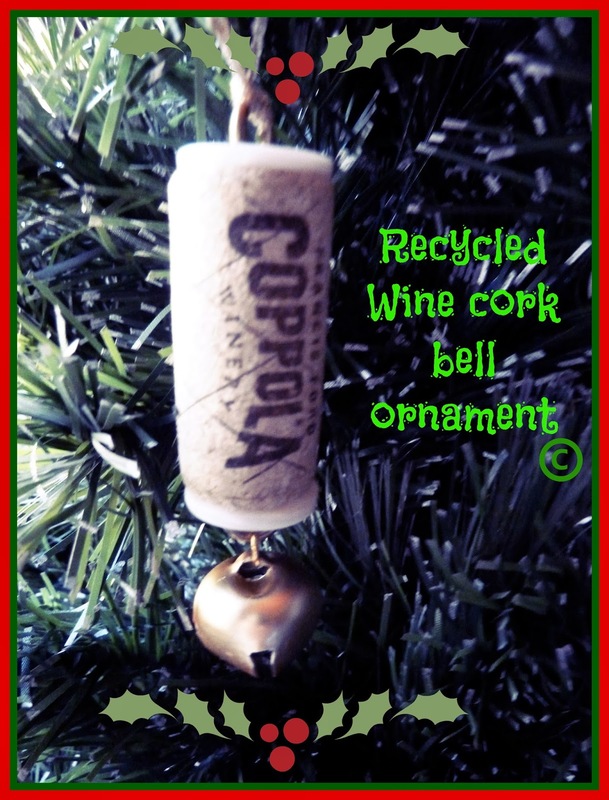 And as an added bonus, as you hang the wine cork bell ornament on your tree remember what little Zuzu says when a bell rings on the Christmas tree in the movie “It’s a wonderful life.” She says, “When a bell rings an angel gets his wings.” And you can never have too many angels! 1. Gather your supplies. Use the awl to poke a hole in the center of each end of the wine cork. This will be your pilot hole where you will add your screw eyes. Center the flat disc bead on one end of the wine cork. Make sure your pilot hole is line up with the center of the bead and attach with some glue. Repeat on the other end of the wine cork. Let dry. 2. Dab a bit of glue on the threaded end of the eye screw (for added security) and then screw into the wine cork. Repeat on the opposite side of the cork. 3. Use the needle nosed pliers to open a jump ring. (Open with a sideways twist rather than pulling apart) Attach to the top loop of the jingle bell and then through the eye screw. Twist to close. 4. Cut a 9-inch piece of 1/8” ribbon in your desired color and tie through the screw eye on the top for hanging. Cool! I have a bunch of wine corks. I may try this! Thanks for sharing at Submarine Sunday! I love this. I don't drink wine, but I have seen the corks in the craft store. 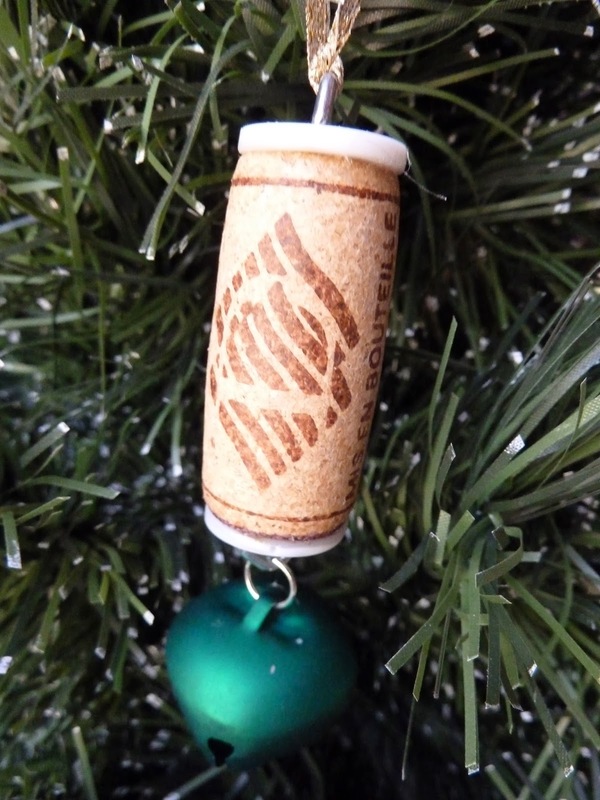 I actually bought a wine cork ornament at a craft fair to use as a pattern. This tutorial is great. Thanks for linking up to Tips and Tricks. This is cute. Great tutorial. Thank you so much for sharing with Wednesday's Adorned From Above Link Party.